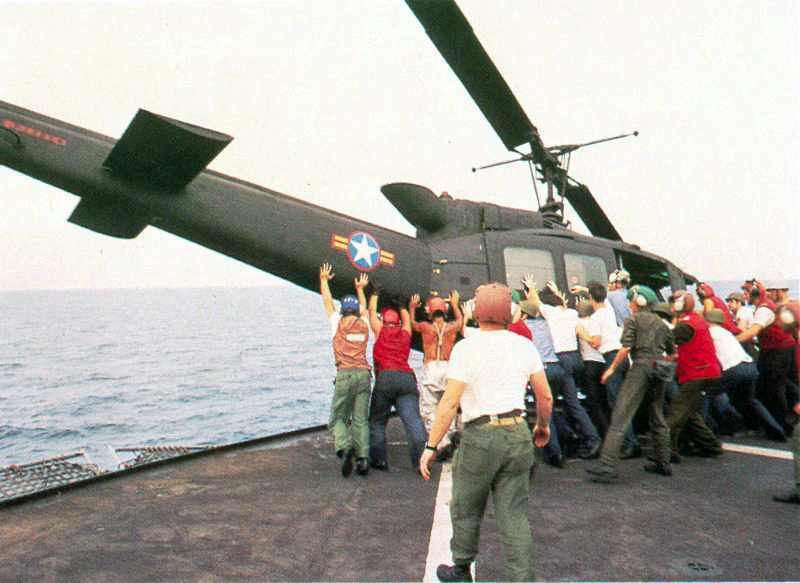 Over two days in April 1975, as the forces of the North Vietnamese Army were poised to take the South Vietnamese capital of Saigon, members of the U.S. armed forces, its embassy in South Vietnam and its Defense Attaché Office evacuated over 7,000 people using only helicopters. Seeing the writing on the wall, the U.S. began to evacuate its personnel and others, including Vietnamese orphans through Operation Babylift. From April 1 to April 29, 45,000 people, including over 5,000 Americans, were evacuated from the country using a variety of aircraft including commercial and military aircraft. North Vietnamese forces were close enough to launch rockets into Saigon. That ended the use of the C-141s for the evacuation . . . [although] C-130s . . . continued to evacuate personnel to the Philippines . . . Conditions in Saigon deteriorated on April 28, when North Vietnamese aircraft bombed Tan Son Nhut and destroyed one C-130. . . . By early morning on April 29, the use of fixed wing aircraft for evacuations ended. To assist with the evacuation, the Navy had moved a large number ships off of the Vung Tau Peninsula in the South China Sea. Several aircraft carriers were among the group, including the Hancock, Enterprise, Coral Sea, Okinawa and Midway. It was a bizarre Kafkaesque time because as those helicopters came into the Embassy one could hear wafting in over the walls of that citadel the strains of Bing Crosby’s “I’m Dreaming of a White Christmas.” That was a code . . . It was supposed to summon all Americans to various staging points. The ground operation, which was to ferry evacuees to lift-off points, primarily the DAO, was soon stymied as terrified Vietnamese who were not eligible for the evacuation tried to leave the country. Many collected at the DAO, as well as the American Embassy, the latter of which was only to be an evacuation point for its embassy staff. The start of the air operation was also delayed and did not begin until about 2 p.m. at the DAO. Things ran smoothly, however, and the first evacuees were safely unloaded at about 3 p.m. By 9 pm., the last from the DAO were loaded onto helicopters, and by the end of the day, about 5,000 people had been safely cleared from it. To evacuate as many as possible before the city fell, marines hastily arranged for more landing spaces, including cutting down trees and moving vehicles from the parking lot. Flying at night through ground fire over Saigon and the surrounding area, [the helicopters] had to pick up evacuees from dangerously constricted landing spaces at the embassy, [including] one atop the building itself. We had 30-40 knots . . . and he started his final approach. He then made a beautiful carrier landing without a tail hook. He touched down right in the wire area . . . . right where he should have, bounced once, rolled up the deck and was stopped before he got to the end . . . . The major and his wife jumped out of the cockpit, pulled the backseat forward, and out tumbled all these little kids. Five little kids they had. She was holding a baby in her arms when he landed. As a young Marine Corporal I was part of Detachment India and participated in Operation Frequent Wind. Our detachment was first on Navy Ship USS Dubuque and then we boarded a merchant marine ship SS Pioneer Commander. Our detachment helped rescue about 6,000 Vietnamese Refugees. It means a lot to me that I was able to play a small part in rescuing those Vietnamese Refugees and help give them a chance to come to America and have a better life.